Over the past several years, I’ve connected with people from all walks of life. I’ve found most people, no matter what their spiritual background want to connect with God. They just don’t know how. I take this for granted, not because I have some special gift, but because I have years of practice – lots of trial and error. So I created a tool to help people interested in knowing God take the first step. My goal is to help you find peace of mind and heart. 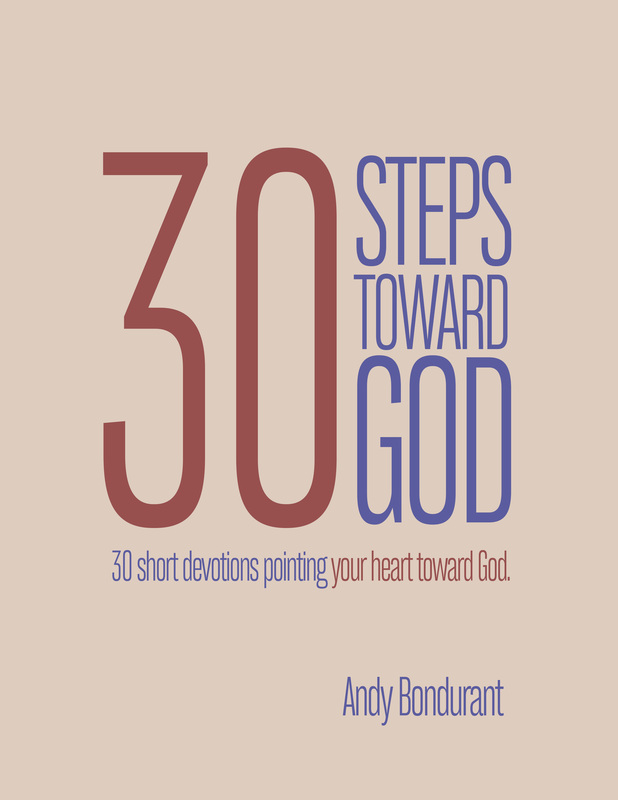 That tool is the ebook 30 Steps Toward God. It is getting great reviews! “Started our morning off with Andy Bondurant’s newly published devotional!” -Amelia R.
“It’s incredibly uplifting and made me think of several stories in the bible that I’ve read before in a whole new light.” -Todd V.
The book is a collection of 30 devotions. Consider each day’s devotion (simply a combination of Scripture, my thoughts and a prayer) as a small tick of turning toward God. Some days your turn may be negligible. Other days your turn might be significant. Repetition is vital. Here’s the best part. I believe in this book, and I believe in you, so I’m giving it away for free. That’s right, completely and totally free – no catch. Simply click one of the link buttons to register for your free copy.